I haven’t posted in a while. My law practice has been keeping me way too busy. Been mostly drinking the old standbys-Eagle Rare and Stagg Jr. Last weekend I watched the fight with a bunch of friends but otherwise I have been working. I hadn’t been to Hokus Pokus on my usual Saturday run in a while. Decided to go today at 5 and not work late. I got a report from the firm today that I had billed over 200 hours this month. So I left “early” (really on time) as an act of pure rebellion. When I got to Hokus I was in for a real treat. 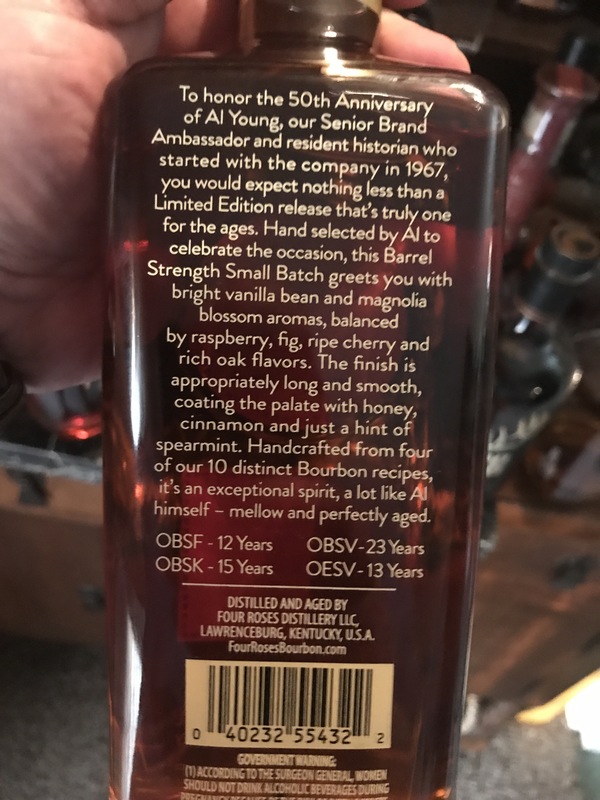 They had 1792 Sweet Wheat, a bottle I had been looking for quite a while, Elijah Craig Cask Strength (I am all about the cask strength), and a single bottle of the Four Roses Fiftieth Anniversary Al Young Cask Strength Edition. Quite the reward after a long month. At $150 a bottle, this should be Pappy Van Winkle quality. It is a blend of four different whiskies of different recipes; Four Roses has ten different recipes. They have a high rye and a low rye mashbill and five different yeasts. 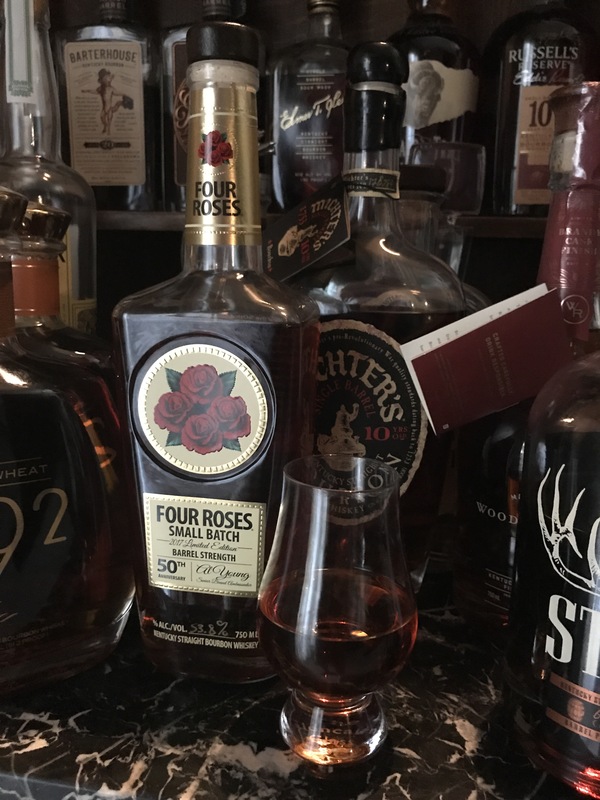 Four Roses explains all of that here. This bottling is predominately B recipe bourbon, which is high rye. The yeasts used are varied in this release, but the delicate fruit yeast is in two of the whiskies used. So, call this a twelve year old based on the youngest whiskey. And at only 107 proof this is pretty weak for cask strength whiskey. Maybe they air conditioned these barrels? Cool 1960’s bottle though. On the nose you get leather and cinnamon but a noticeable lack of oak given the age and non-dilution of the bourbon. An intriguing but subtle nose. A sip reveals more burn on the tongue than the proof would usually cause. It actually made my gums tingle. Leather, cocoa, cinnamon, all spice. Nice flavors once you get past the burn. But the oak is just not there; the barrels must be medium to light char and kept very cool is my only guess. It is an excellent representation of Four Roses’ style of bourbon; floral with many subtle flavors. 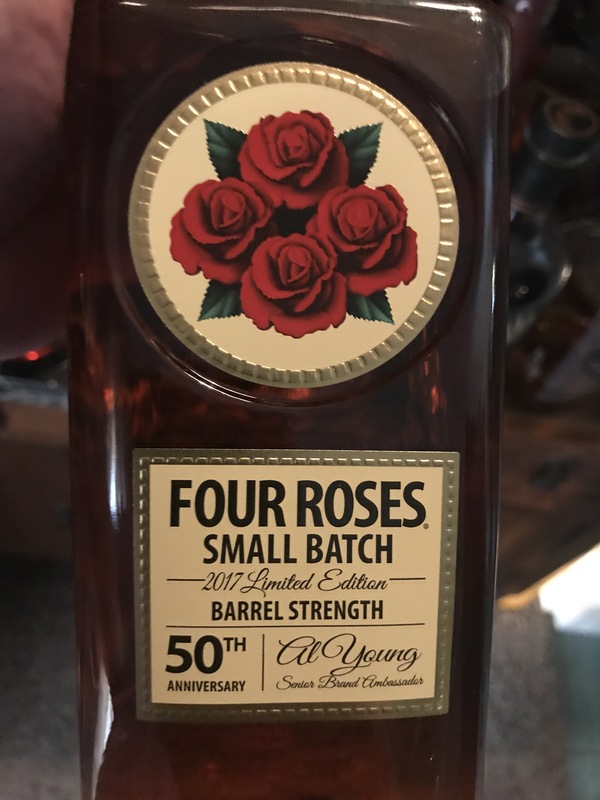 If you are a Four Roses fan this one really hits that flavor profile out of the park. But when I buy cask strength whiskey I am really hoping for oak. I would say this is on the level with Pappy 12, sort of. Definitely good but a missed opportunity as far as oak flavor is concerned.